Whitbread have supplied copies of the material used at the recent public consultation meeting on their plans for the American Carwash site. 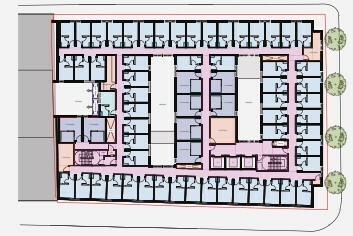 Whitbread intend to submit an application for change of use and planning permission in August for a hub concept hotel. So there is a decent opportunity now to get local views in before they lock down on an application. If they gain planning permission that will complete a deal that will give them freehold of the site. For people like me who couldn’t make the local meeting you should be able to find the documents and drawings presented in this folder and I show extracts below and the picture above (a bigger version is in the folder). I met with Whitbread who seemed sincere in their attempts to do a decent job here that works for them commercially and the community. Most people locally must want this site to be properly developed, ending the nightmare saga but that doesn’t mean the community should roll over. The overall design has been to an Islington design panel – the design picks up cues from local period warehouse architecture. To me it seems blocky from the angle above. This substantial volume of people will be a major change for Wharfdale Road (I lived on Wharfdale in the mid 90s – it was a different world then). This isometric drawing shows just how much of the North face has had to be cut away to prevent ‘rights of light’ issues with York Central. It’s a six story building with a green roof. The building steps back from Crinan Street as well, but not from Wharfdale Road nor York Way. 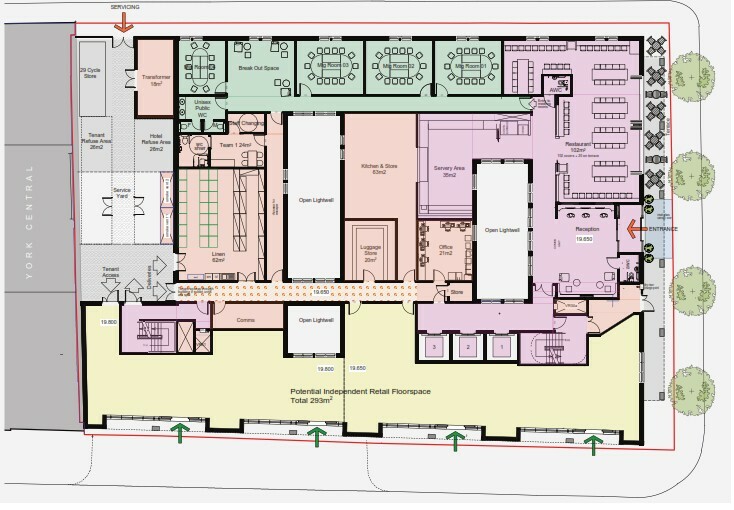 The ground floor plan shows a main entrance on Wharfdale Road and a service entrance on Crinan Street. With retail units on York Way. Whitbread were at pains to say that the lack of major food service would mean only two lorry deliveries (with accompanying reversing beepers) per day on Crinan Street. I am a little sceptical of this number. 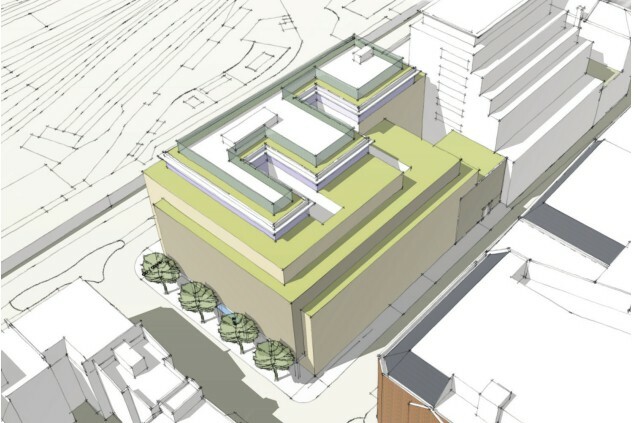 The retail units on York Way could be a mixed blessing – convenience and food/beverage use under a large hotel without its own catering could lead to a transfer of noise and foot traffic to the pavement at anti social hours. But these could perhaps in planning be made to diversify to independent businesses preventing more Starbuckisation. Transport and logistics are a tricky issue here. The turnings from York Way into Wharfdale Road are un-reconstructed KC Gyratory and very poor. Anything that adds stopping, drop-off traffic a few metres from the corner will cause all sorts of problems – not just for safety but backing up lorries and buses threatening TfL’s sacrosanct ‘smoothing traffic flow’. The upper floor plan brings home the small size of the rooms in the hub concept – essentially a double bed against a wall with a bathroom occupying a smaller space an a walkway alongside (pictures of room mock up in the documents folder above). Whitbread said to me that they have a policy of employing 50% NEETs which is good news. Dull, dull, dull. Another anonymous, ugly looking block, with more transient population. Is this really the best they can do, or are they building to a price (ie as cheaply as possible)? 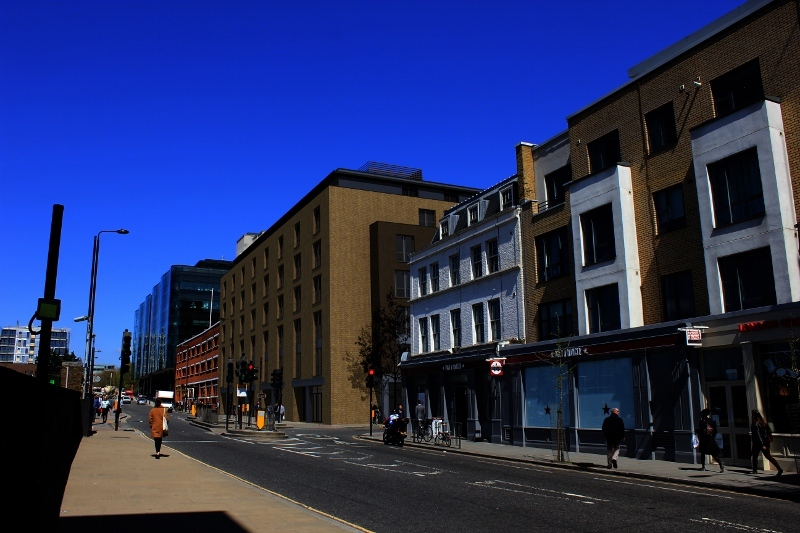 Kings Cross is full of hotels, where is the demand for another one, and where is the response to the local area’s needs as opposed to corporate exploitation of the new developments? Some of the blocks already built further down York Way are truly horrendous, where is the ambition for this vast new site?